For a long time in America, duck was king. Alongside our native bird the turkey and the (until the 20th century) expensive and scarce chicken, duck was a rich and indulgent dish for family get-togethers and dinner parties. 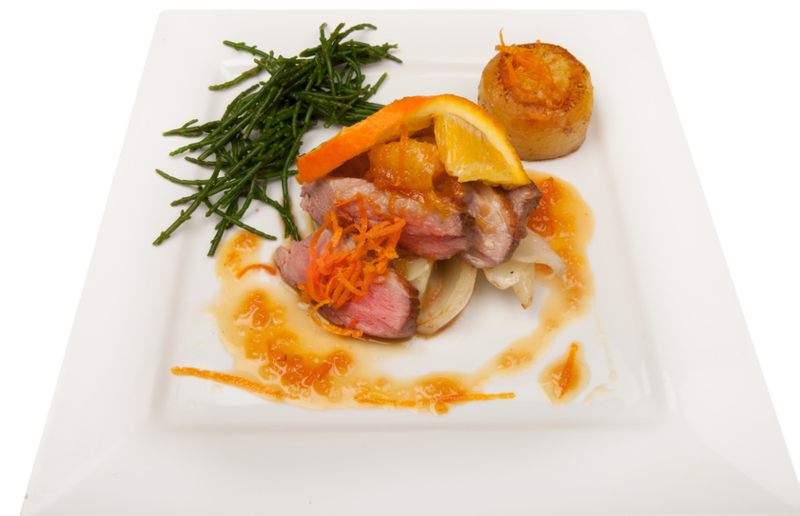 Duck a l’Orange, the classic French recipe, was the go-to dish for a celebratory meal, while also being comparatively easy to prepare. Also a factor in duck’s popularity in North America was its Chinese roots, which meant that in major U.S. cities with large Chinese settlements, duck’s pre-eminence in Chinese cuisine—highlighted by the iconic Peking Duck with its crackly, crispy skin—enabled it to cross over to the American palates of more adventurous diners. In 1872 the entire U.S. Pekin duck industry was begun from three (female) ducks and one (male) drake that survived the perilous journey from Shanghai to NYC. Those first purebred Chinese ducks, imported by James E. Palmer of Connecticut, were eventually crossed with German Pekin variant, Japanese ducks imported by the Dutch, and the British Aylesbury breed, to become the foundation stock for the classic American Pekin duck line. The American Pekin was grown throughout the Northeast, but the presence of many farms on Long Island led to its other popular name, the Long Island Duck. It wasn’t long before the Pekin completely replaced the dark-feathered native Cayuga duck in the market, thanks in large part to the easier task of plucking and cleaning the snowy white plumage and pinfeathers from the processed bird for an attractive finished product. Regrettably, this popularity wasn’t destined to last. Despite attempts to cater to America’s love affair with now-plentiful and inexpensive chicken by breeding leaner, milder-flavored duck varieties, duck meat consumption dropped off rapidly in the ‘60s through the ‘80s. Market forces helped the process along. Most duck farms in the U.S. closed, and the few remaining consolidated–as did most U.S. farming—with the decline of the family farm. The Northeast was especially impacted as the cheap farmland they depended upon was subjected to heavy taxation and regulation, and finally snapped up and repurposed for more profitable residential development. American Pekin has enjoyed a dramatic turnaround. Duck is making a comeback, and we are proud to be at the head of that trend.